Welcome to Hong Leong Yamaha Motor | XPEDISI YAMAHA 135LC CROSSES THE FINISH LINE! XPEDISI YAMAHA 135LC CROSSES THE FINISH LINE! 23 Mar XPEDISI YAMAHA 135LC CROSSES THE FINISH LINE! 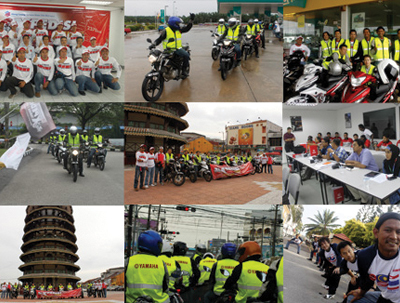 A complete success for Yamaha 135LC’s inaugural convoy ride from Johor Bahru to Bangkok. Bangkok, 23 March 2012 – The first ever Yamaha 135LC convoy ride from Johor Bahru to Bangkok that is jointly organized by Hong Leong Yamaha Motor (HLYM)/ HL Yamaha Motor Research Centre (HLYR), and Yamaha Motor Asian Center (YMAC), Bangkok ended today. This XPEDISI YAMAHA 135LC 2012 covered a total distance of 2560 km (more than the originally planned 2370 km) over a period of 11 days from 13 to 23 of March starting from Johor Bahru with stopovers in Kuala Lumpur, Pulau Pinang, Perlis, Padang Besar, Krabi, Phuket, Phang Nga, Chumporn, Hua Hin before finally reaching Bangkok. The aim of this ride is to promote safe riding and to showcase the superior riding performance of Yamaha 135LC machine. The riding convoy completed the full distance, arriving at the YMAC facility in Bangkok safely. Management and staff of YMAC were at hand to welcome the convoy group who were pleasantly surprised by the cheering crowd. Upon their arrival, a bouquet of flower was presented to each rider by the President of YMAC, Mr. Makoto Shimamoto, who congratulated all the participants for their achievements. 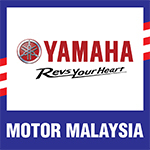 A total of 9 riders consisting of Yamaha staff from Japan, Thailand and Malaysia took part in the XPEDISI YAMAHA 135LC 2012.